Kyrgyzstan: Did Moscow Subvert a U.S. Ally? 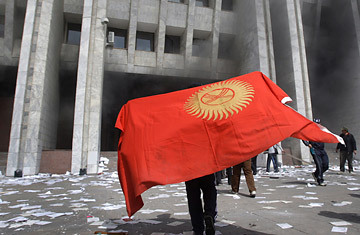 As workers washed the blood and rubble from the streets and families mourned the nearly 70 people killed in the violent revolution that swept Kyrgyzstan, Russian Prime Minister Vladimir Putin put in a caring phone call on Thursday, April 8, to Roza Otunbayeva, the opposition leader now in command of the impoverished Central Asian state. He promised her financial aid, legitimacy and a "special relationship" with the Kremlin, and she gladly accepted. The move was significant: it seems clear now that Kyrgyzstan will quickly return to Moscow's sphere of influence after months of strained relations with Russia, making the U.S. military presence in the country all the more precarious. Russia appears to be happy with the outcome of Wednesday's uprising, which caused President Kurmanbek Bakiyev to flee to the south of the country  though he has yet to give up power. But what remains somewhat unclear is whether Russia was directly involved in the protests that prompted his ousting. On Friday, April 9, Omurbek Tekebayev, another leader of the revolutionary government, claimed that it was. In an interview with Reuters, Tekebayev said Russia had "played a role," adding, "You've seen the level of Russia's joy when they saw Bakiyev was gone. So now there is a high probability that the duration of the U.S. air base's presence in Kyrgyzstan will be shortened." Moscow, however, has been less forthright on the matter. On Wednesday, Putin staunchly denied any involvement in the unrest. "Not Russia, not your humble servant. Russian officials have nothing to do with these events," Putin said. Yet he went on to chastise the Bakiyev government for "stepping on the same rakes" as the corrupt leadership it had itself deposed in 2005. On Thursday, Putin made it even clearer which government he preferred. "Due to the special relationship between our two countries, Russia always has provided the necessary humanitarian aid to the people of Kyrgyzstan and is ready to continue providing it," he told Otunbayeva in a telephone conversation, according to a statement placed on the Russian government's website. Putin's spokesman later told the Interfax news agency that Russia had recognized the legitimacy of the new leadership. "It is important to note that Vladimir Putin was speaking to Otunbayeva in her capacity as the head of the interim government," the spokesman said. Whether or not Moscow played a part in encouraging the opposition, the turn of events marks a sudden reversal in relations between the two countries. Ties between the Kremlin and Bakiyev's government had deteriorated sharply in recent months, in part because of Bakiyev's powerful son Maxim, who had acted as a negotiator with the U.S. over the use of the Manas air base outside the capital, Bishkek, to ferry supplies to U.S. troops in Afghanistan. (Amid Wednesday's upheaval, the U.S. State Department said Maxim Bakiyev was on his way to the U.S. for consultations.) The opposition had also accused the Bakiyev government of taking an increasingly anti-Russian stance on various issues. Russian-language websites were recently blocked or shut down in Kyrgyzstan, prompting the Russian embassy to officially express its concerns last month. Russian businessmen in the country had complained of discrimination. And most infuriating of all for the Russians, President Bakiyev did not follow through with a pledge to shut down the U.S. air base last year after the Americans nearly quadrupled their yearly rental payments. The Kyrgyz opposition, meanwhile, took up the Russian cause in recent months, expressing deep concerns that Bakiyev's government was siding too closely with the Americans at the expense of traditional ties with Moscow. Otunbayeva was at the forefront of this initiative. In February, when she was still an opposition leader in the Kyrgyz parliament, she told Bakiyev's government that it "must not act the way it's acting toward Russia, which is our strategic partner and ally." This coincided with growing distress in Kyrgyzstan over the continued American presence in the country. In early March, a member of the country's influential Council of Elders, Omurbek Umetaliev, said many of Kyrgyzstan's political troubles have resulted from the fact that the country is host to two military bases  one American, the other Russian. "We believe it is unacceptable to allow the existence on this limited territory of military bases from two leading world powers, which have conflicting positions on many issues of international politics," said Umetaliev, who also heads the opposition Pensioners' Party of Kyrgyzstan. "Although the presence of a Russian military base in Kyrgyzstan is historically justified, the military presence of the U.S. and NATO countries is a threat to our national interests." In an indication of how comfortable Russia feels at its base in the Kyrgyz city of Kant, Russian President Dmitri Medvedev sent 150 paratroopers on Thursday to shore up the Russian forces there. The U.S., meanwhile, halted flights to its Kyrgyz base on Wednesday and Thursday. It remains to be seen what shape Otunbayeva's foreign policy will take. In the past, the 53-year-old career diplomat has served as both a Soviet apparatchik in Moscow and a Kyrgyz ambassador to the U.S., Britain and Canada. While the country remains in a state of limbo, Otunbayeva and the other revolution leaders have tempered their pro-Russia rhetoric, focusing on the consolidation of power at home rather than jumping into foreign policy dilemmas. They've said the U.S. can continue operating its military base for now, and they've pledged to hold elections in six months, although not before rewriting their constitution. But when the new leaders begin to look for aid to finance the reforms they have promised their people, they will be sure to turn to their foreign benefactors  and Russia, for one, has already pledged its unflinching support.